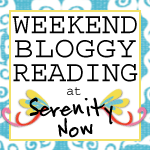 Welcome to Weekend Bloggy Reading! I hope you will leave me some comment love today and also take a minute to link up your best post of the week from your own blog. ~Leslie featured a thought-provoking guest post on Restoring Your Husband's Shining Armor. Good stuff! ~I fell in love with the rustic look to Jodi's Coffee Table. ~Peanut Butter and Jelly Cupcakes? I am intrigued, Chiara. ~Melissa shared 4 Tips for Styling Coffee and Console Tables. Great photos! This week, I showed you my new Snowflake Window and shared about a great Silhouette Promo that ends on Saturday. On Tuesday, I shared a tutorial on How to Make the Perfect Cafe Mocha. 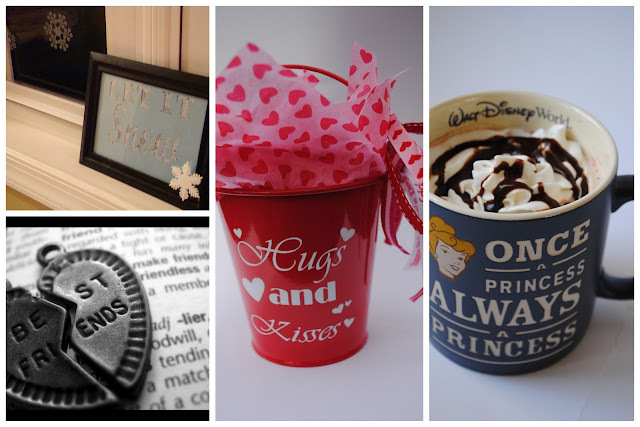 I opened up a little and shared about Friendship on Wednesday, and Thursday brought another Silhouette tutorial featuring a Valentine's "Hugs and Kisses" Bucket. I'm off to get ready for Michaela Byrd's 3rd birthday party tomorrow morning! Thankfully, the birthday girl agreed to a Cinderella themed party like her sister had. This makes things decidedly easier on Mommy. Good Luck with the birthday party! We have a weekend jammed packed full of basketball-5 games-and one of my girls has a bday party. 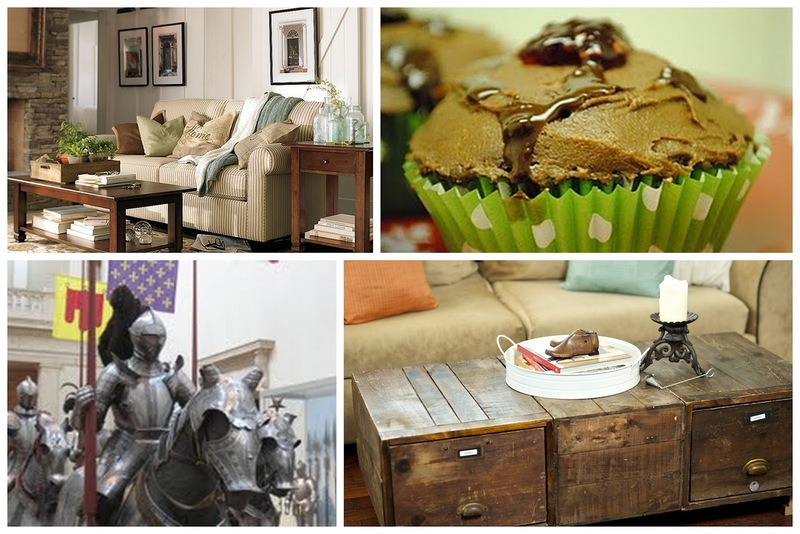 Off to check out all the coffee table tips! Thanks! Thanks for hosting this party...I don't always participate because I don't usually have anything interesting that I've blogged about. LOL But it's a fun one. I hope the birthday party goes well...totally awesome for you that the girls wanted to same birthday party! I wonder if that will still be true when they are older and maybe a little competitive! Love all your ideas this week. You are making me want one of those machines - bad girl! Thanks for hosting. Have a fabulous weekend! I know this isn't a Decorating Dilemma party, but I decided to link my decorating dilemma post to this party! I'm hoping to get some feedback about how to handle the corner of my living room. As always, thank you for being a gracious hostess! Thanks for hosting!!! Can't wait to spend some time this weekend visiting the other bloggers in your party! I have made some new friends too! Blessings on your birthday girl!! Anyway...have a great weekend friend! I've been meaning to tell you that I saw a comment you left on someone else's blog the other day--I'm not sure whose blog it was--but you said something like "My five-year-old likes. . . ." And I thought, "WHAT? Five-year-old??" I am having trouble believing that Natalie is five years old. And little MB is going to be three? That "best friends" heart reminds me of all my best friends for whom I have several titles, like: vbaff (very best Alexandrian friend forever). Or vbfic (very best friend in China). We sign our emails like that and it always makes me grin. Have a great weekend. I always use the line that was portrayed in your post with my daughter - once a princess, always a princess. What a fabulous idea for a link party! I am for sure linking up :) you rock Amanda! Thanks for hosting the party. I'm looking forward to coffee and reading the links. Hope you have a great birthday celebration today! It's great that you'll get double duty out of some of the decorations. I'm having a sewing lesson this afternoon on how to use the embroidery feature on the machine that I inherited from my mother in law. We have tennis both days this weekend and a beer tasting to go to tonight. That's about fills up both days! Have a good one! I hope the birthday party is great! 3 is such a fun (and challenging) age, as I'm finding w/ Sophie. I posted a little giveaway from my new endeavor. Thanks for hosting this! Thanks for a fun link up party! 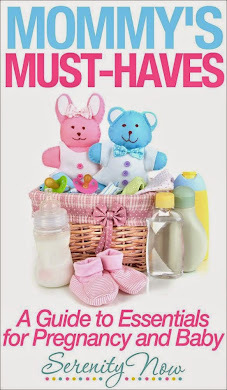 I am actually working on preparation for my sweet daughter's 1st birthday! She is our little miracle and I'm so excited! Thanks so much for hosting! Hope your weekend is wonderful! Just found your blog and I am lovin it! Thanks for hosting. I am new here, found you through Peace.Love.Mommy! Look forward to following! What a fun link party! :) I found your blog via LMM. Soooooooooo cute! Thanks so much for your comment on the new teaching blog idea. I'm trying to get the word out there and gain more followers, most of whom would be interested in a second (teaching) blog! Any ideas for spreading the blog around? ?